Figure 1. Clayton Valley. Google Earth image showing the location of RLC's placer mining claims, with the evaporation ponds of Albemarle Corporation's Silver Peak Lithium Operation to the lower right. 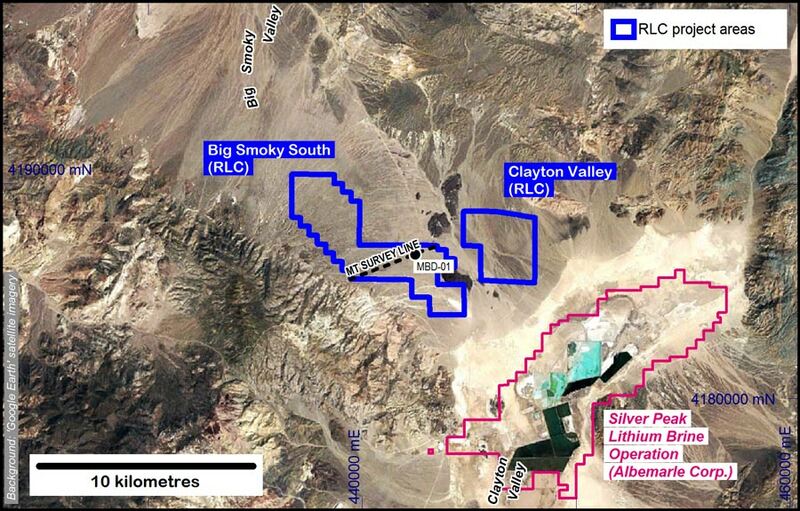 Clayton Valley Project is located within 10 kilometres northwest of the Silver Peak lithium operation where the southern end of Big Smoky Valley meets the western side of Clayton Valley (Nevada, USA). The project area was acquired by claim staking following interpretation of the geology observed in the core of drill hole MBD-01 on the nearby Big Smoky South project (ASX 24 May 2018 ). Multiple brine filled aquifers within sediments over a vertical interval of approximately 200 metres have been interpreted by the Company in 3-dimensional audio MagnetoTelluric (3D AMT) survey data (ASX 23 August 2018 ).